Here is a uniquely-positioned dark ambient offering from Claudio Begovic, aka Haunted Me. Influenced by Brian Eno and William Basinski as much as the northern European pioneers of that broadly defined category, Begovic’s latest covers a lot of ground across its seven tracks. Incorporating oscillations, rhythmic object percussion, echoing bass lines, boiling soundscapes, slow electric guitar themes, and harsh noise wall components, Plague is not only remarkable for its diversity, but also its singularly compelling nature. No two of these tracks sound like one another, whereas most artists that incorporate any one of the aforementioned styles tend to stick with that particular approach. In contrast, Begovic produces sound art that varies in dynamics, instrumentation, source material, and feel. These compositions are both complex and understated. But even if one prefers not to analyze Plague by taking it apart, at a surface level the album is a disturbing and (yes) haunted journey through unfamiliar landscapes and moods. Plague could easily have been a soundtrack for a psychological horror movie, but works remarkably well as a standalone effort. Highly recommended. UK’s Cold Spring Records puts out recordings of a wide variety of unsettling music: dark ambient, neo-folk, harsh noise, and experimental. Skullflower, which centers around Matthew Bower, fits the more extreme end of that spectrum. Bower has recorded under numerous monikers for over 30 years and this double-album reflects the confidence that comes with experience. The Spirals of Great Harm features traditional instrumentation, particularly guitars, rather than just electronics. But this might not be apparent initially. To that point, the album is a viscous, ever-shifting series of noise walls featuring long drones from distorted chording. Hidden in these walls are some subtleties that careful listening will pick out – a melody or two within the mass of sound. 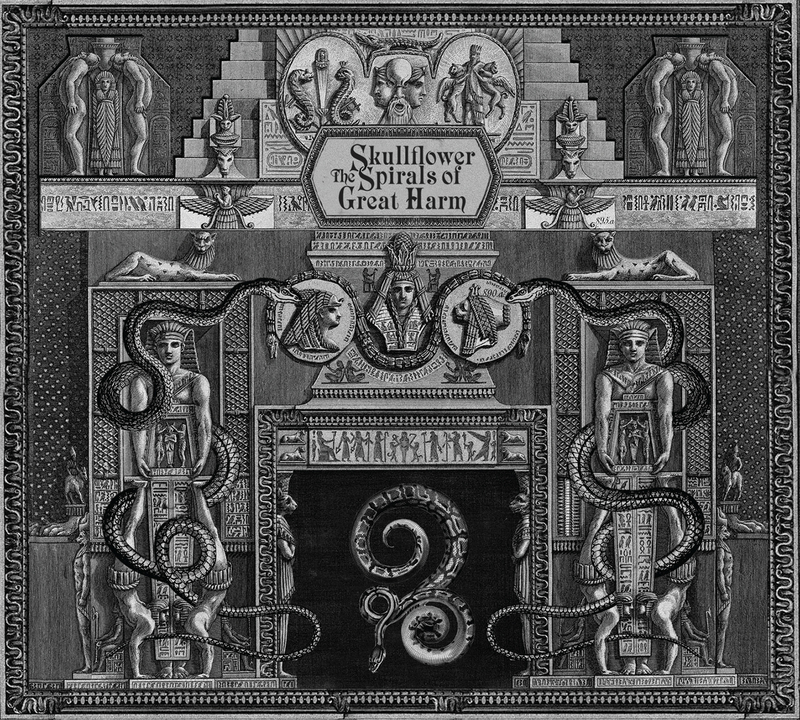 But Skullflower ultimately offers an overwhelming post-post-rock and post-industrial set, fitting for both foreground and background absorption. Comparisons to early 70’s Krautrock are not out of order here, though without the rhythmic emphasis. A welcome slab of dissonant, twisted darkness from an early purveyor of the same. Since the early 90s, Susie Ibarra has been one of the most exciting and compelling composer/performers to come through the world of New York experimental music. As a drummer, there is really no one like her, a top notch improviser who turns her kit into a fine tuned orchestra. She’s worked closely with Ikue Mori, John Zorn, Sylvie Courviosier, David S. Ware and many more and continues to inspire drummers all over the world. For this talk, Susie takes me back to her upbringing in Texas, where as a teenager she opened for the Flaming Lips, her early days in New York, and much much more.